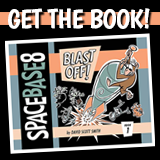 Life can be tough for Space Base 8’s Rocketship Crash Test Monkey. Good thing his best friend and roommate, Lighthouse, is around to lift his spirits. If only he could get Meela to admit she wants to be more than just his friend, all the disrespect he gets at work would be a little more bearable. Don’t give up, Cargo! If it weren’t for Meela, nothing would ever get done around here! As Administrator she alone handles all the paperwork on the station, and on top of that serves as Space Base 8’s Ambassador-at-Large. Even so, the only person who really seems to appreciates her is Cargo. But a girl like her could never really like a space monkey like him…could she? You can find this shy little robot sitting atop the main antenna, shining his beacon light to tell spaceships where to find Space Base 8. All that time alone has given Lighthouse lots of time to develop a wonderful imagination, but not much practice with his social skills. His innocence charms everyone he meets, but his best friend in the galaxy is his idol, Cargo. Boz is the boss around here, and that’s enough talking over there! You come in late, you I’m docking your pay, and what you are doing there isn’t good enough. There isn’t enough money in the budget for that, and what are you all doing just standing around? Get your lazy butts back to work!!! Science robots have to be exacting and precise in all that they do. They like things to be in order, and expect the universe to stand up and get analyzed. So don’t get offended when Vesto gives you a long list of your faults and failures. You should thank him for being so thorough and accurate. He’s never wrong, you know. Just ask him. If someone has to miss a day at work, they call Space Base 8’s one and only temp, Oril. Don’t worry if more than one person calls in sick, because Oril is a time traveler. He’ll work today’s shift in the lab, then travel back to this morning and work a shift at the office. But be prepared to pay him overtime, of course.